the mountains leapt like ewes and rams, the hillsides skipped like playful lambs. What makes you leap, O hill and sea? Why, Jordan, do you turn and flee? O, tremble, earth, your Lord is come to lead all people safely home. 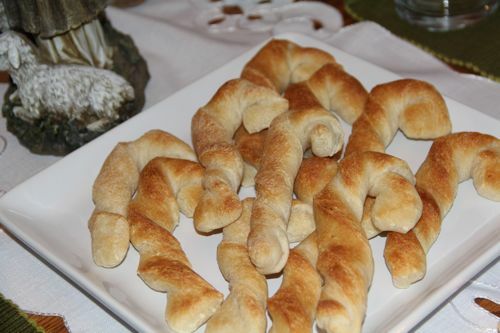 This year I made a double batch, and we had plenty! 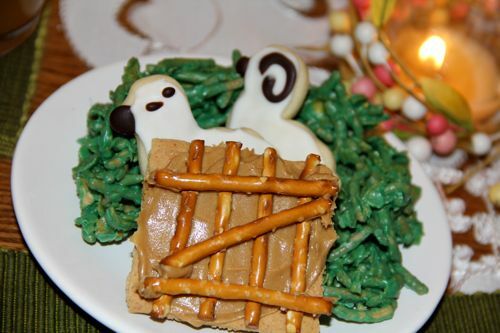 We had lots of cake this past week, leftover from Easter Sunday, so we opted to make a Sheepfold (with the leftover ingredients from our Bird's Nest Cookies) and Ewe & Ram Cookies (using the cookie cutter from our Nativity Cookie Cutter Set ). 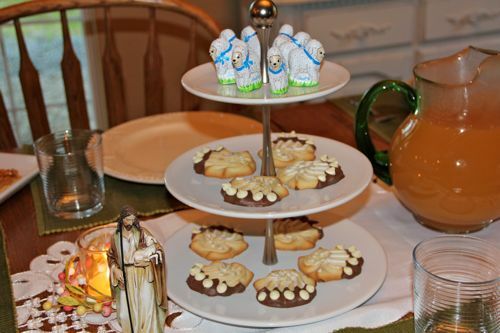 We actually made them on Friday (after decorating the crown cookies), so this really simplified things on Saturday evening! I don't think I would have had the time to make them otherwise. While I was busy preparing the Shepherd's Pies, the kids assembled the Graham Cracker Gates. I had a slight problem with our Lamb's Wool Punch "Tea" this year. I didn't have time to make it earlier in the day, allowing it to Chill, and apparently it hadn't cooled enough before I poured it into my Glass pitcher. . . resulting in a nice crack. Ooops!!! :( I guess I need to start looking for a new pitcher! Like last year, Captain assembled the Wolf Paws! Welcome to the Lord's Table! 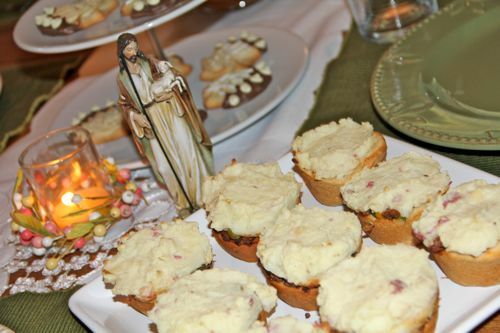 Don't forget to head over to Catholic Cuisine to share pictures from your party! what a lovely Garden of the Good Shepherd party! we had our first ever Garden Party yesterday and loved it. thanks for sharing your ideas. Jessica, you have such good ideas! This is so beautiful. beautiful celebration. praise God that you are able to devoutly keep your blessed traditions. may you continue to inspire others and glorify God in all you do. Hi Jessica! I love your blog. I was wondering if you would ever be able to post on your daily schedule and how you are able to fit all these things into your day. I have four children and have a hard time keeping up with the basics. 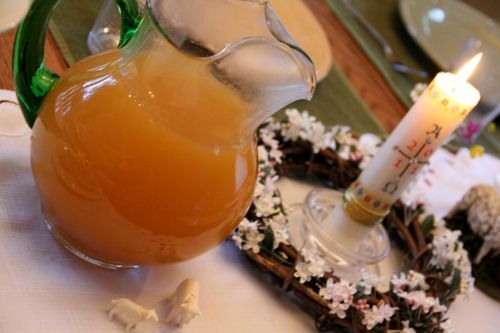 I would love to learn how to incorporate more of these catholic traditions into my day! Oh, Jessica, you are wonderful. Do you some help in your home, like a lady to help you?? Because i can not do all things alone. I have one lady that help me and 3 children. And i can not do almost nothing. So God bless you so much!!!!!!! Help us...other mothers to do like you!!! or similar...yes, i ask you too, write something about day schedule to help us! 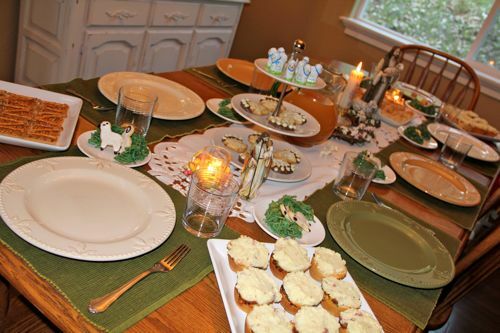 Jessica, your table is always so beautifully set. 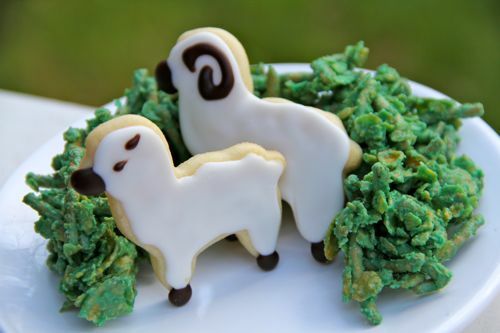 Of course I love everything, but I think my favorite items are the ewe and ram cookies (beautifully decorated) and the super cute sheepfold. I love your statue of the Good Shepherd. It looks like it is made by Joseph Studios. I have a St. Anne statue made by them that is my favorite. And I purchased a paschal candle from Illuminated Ink this year for the first time after seeing how lovely yours turned out. Thank you for being such a wonderful inspiration. May God bless you! I've done that with a pitcher... apparently it was crystal, and I didn't even know it. The people at the store where it came from were appalled that I would pour hot liquid into a gift from their prestigious store, ha ha! I didn't even think about it. Does hot liquid break any thin glass-like material? The sheepfolds are very cute with the cookies inside of them! We did a Garden Party yesterday too - thanks so much to you and Charlotte for creating the ideas for us to use! What a wonderful party! 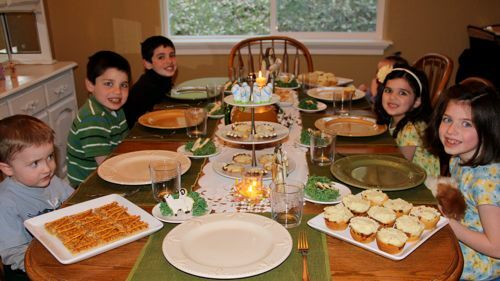 I am blogging our week 1 party right now :) You may have heard this before, but I noticed my wonderful mother-in-law stuck a butter knife in her glass pitcher as she poured in hot tea. Apparently, and I don't know how, this keeps the glass from cracking! Thanks again for the beautiful ideas! You never fail to inspire and draw others to the Lord's table. God Bless all of your Garden Parties! Rachel and Liany ~ I have posted about my schedules a couple times, but it constantly seems to be changing and I am always looking for new ways and ideas to "keep up" with everything I need/want to do! :) I don't have any hired help, but my husband is wonderful and helps out whenever he can. (I am considering looking into a weekly cleaning lady for this coming school year, but I am not sure if we will be able to afford the extra expense.) I will keep your questions in mind, and see if I am able to put something together on how I "plan" out my days. God bless you both!! I had never heard that about the butter knife! How interesting!! I thing tha God do a miracle in your life!!! Lovely, just lovely! And I couldn't help noticing that you said you were feeling tired lately...it kind-of jumped out to me and I'm wondering if you might be planning an exciting announcement soon?!?! Really, Jennifer?! That's funny that you would notice that... Well, I guess you are going to just have to wait and see! ;) Thank you for the prayers!!! 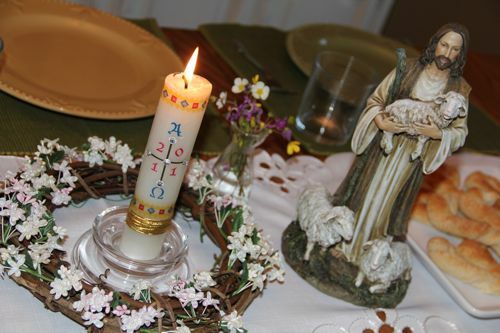 I absolutely love your paschal candle for your table! I've been trying to hunt one down for this coming Easter that is as nice! Where did you find this one? I hope it is still available or something similar! Hope all is well with the new baby! I've come across your blog in recent weeks and LOVE all your info/resources/ideas! My daughter is in K right now, so just starting out on this homeschooling adventure! It really is a gorgeous candle. Hope that helps! Thanks so much for the info on the paschal candle - I actually came across it while doing a little more hunting on your blog - LOL! I've checked out the online resources and the 2012 ones are yet to come out, so will have to keep an eye out for now! Trying to get a jump on things - they come up too fast! Thanks again!